Among ladies’ clothing, nothing can be more chik, more elegant, more youth looking than a cape or a poncho. 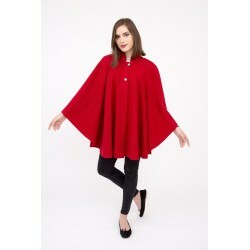 You’ll be elegant, refined, and trendy wearing capes and ponchos in the most varied cuts from Heliotrop Fashion Design. Made from distinguished cloth in beautiful colors they emphasize the silhouette providing maximum comfort in autumn, winter or spring. You can wear them for any occasion wether you are a teenager or young woman of any age. Associating them with any outfit, from sport, to office, to cocktail, to evening you can create unexpected appearances. We especially suggest them for the winter holidays.